The Angel Program is an important part of the success of Mickaboo. Please join us and have the satisfaction of helping a needy animal by sponsoring one of our foster birds. 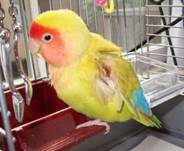 Visit our Angel Page, where you can select the needy bird of your choice. Here is the story of one of our newest foster birds needing your help, Sunflower. 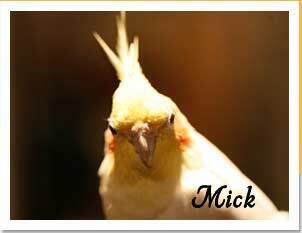 Like so many birds, Sunflower came to Mickaboo from a shelter. They noticed he was missing feathers on his neck and had a bleeding wound on his left wing. After being rushed to the vet who hospitalized him for two days, he was given one of those collars every bird hates. That and the medicines administered by his foster mom helped him heal. As you can see on this recent picture, Sunflower has new feathers growing in. We will never know what hurt his wing so badly. Your sponsored bird will appreciate your caring!